BUCHANAN, N.Y. — Gov. Andrew Cuomo is calling for an investigation after an apparent overflow at the Indian Point nuclear power plant spilled highly radioactive water into an underground monitoring well, but nuclear regulators said the public isn’t at risk. Officials at Indian Point in Buchanan reported on Friday that water contaminated by tritium leaked into the groundwater under the facility. The contamination has remained contained to the site, said Cuomo, who ordered the state’s environmental conservation and health departments to investigate. The leak occurred after a drain overflowed during a maintenance exercise while workers were transferring water, which has high levels of radioactive contamination, said Neil Sheehan, a spokesman for the Nuclear Regulatory Commission. Normally, a sump pump would take the water and filter it into another treatment system, but the pump apparently was out of service, Sheehan said. After the drain overflowed, the water seeped out of the building into the groundwater. “While this instance of tritium in the ground is really not in accordance with our standards, there really is no health or public safety consequence,” spokesman Jerry Nappi said. © Eric Gay/AP Vice President Pence (center right) and Texas Gov. Greg Abbott (center in wheel chair) help move debris during a visit to an area hit by Hurricane Harvey in Rockport, Tex., on Thursday, Aug. 31, 2017. He hugged victims of Hurricane Harvey and comforted those with tears in their eyes. He prayed and posed for photos, at one point blaring his message of support into a bullhorn. And he donned durable blue gloves and cleared brush, working up a sweat as he dragged debris away from a damaged white mobile home. Put another way, he did what many other presidents have done in the face of disaster. But the blue jeans-clad man who spent Thursday communing with victims of the 1-in-1,000-year flood event in Southeast Texas was Vice President Pence — not President Trump.The images of Pence’s trip to Texas on Thursday offered a striking contrast between Trump — who came under bipartisan criticism for initially failing to seem to empathize with those affected by the devastating storm — and his No. 2, who spent the week performing relief duties. White House officials said the president and the vice president were merely working in tandem to coordinate the federal government’s response to Harvey, magnifying their efforts through complementary skill sets. Trump, after all, visited Texas on Tuesday — though he steered clear of flood areas or victims — and plans another trip to the Gulf Coast on Saturday. Trump also took several moments Wednesday to address “the deeply tragic situation in Texas and Louisiana” before a scheduled speech on taxes in Missouri. But Harvey put an uncomfortable spotlight yet again on Pence, underscoring the delicate balance the vice president must manage in supporting and complementing the president — while never overshadowing him. In many ways, Pence’s handling of Harvey — from his visit to the Federal Emergency Management Agency Monday to the slew of local radio interviews he did — would be routine but for the president he serves, a man whose own instinct for public displays of compassion are often unconventional. During Trump’s visit to southeastern Texas on Tuesday, he managed to place himself squarely in the eye of the storm, at one point convening an impromptu if brief political rally. (“What a crowd! What a turnout!” he enthused). White House officials said ­every relief action Pence took this week was part of a methodical, coordinated effort between his and Trump’s teams, with a particular emphasis on communication — one of the most important roles they think the administration can perform during a natural disaster. Trump’s initial Texas trip was intentionally focused on coordinating federal, state and local response, while Pence’s visit two days later offered more latitude to focus on the survivors who are just beginning to rebuild their lives, officials said. The president, one senior White House official said, was eager to head to Texas on Tuesday to clearly convey his support for those suffering but was conscious of not wanting to interfere with search-and-rescue efforts or divert resources. His trip on Saturday, the official added, will allow him to personally connect with those affected by the storm. The two men have been speaking “multiple times” a day, aides to both said, and their teams have been working in lockstep to coordinate the administration’s response. Pence’s speechwriter, for example, checked in with the president’s aides before Pence delivered a speech Wednesday in West Virginia, to better amplify Trump’s message. Scrutiny of his role has left Pence’s allies and aides exasperated at times, believing that the media hypes — and over­analyzes — just about everything he does. Early in the administration, Pence weathered a spate of articles about how he seemed to be in the dark on several issues, including a high-profile incident in which former national security adviser Michael Flynn misled the vice president about his conversations with the Russian ambassador. Later, news reports said Pence was operating as more of a shadow president with Oval Office aspirations of his own. Pence can’t, his aides argue, be simultaneously out of the loop and angling for the top job. Some of the images of Pence dealing with Harvey, however, raised eyebrows, including photos of him over the weekend in the Situation Room flanked by Cabinet officials while Trump video-conferenced into the meeting from Camp David. Pence’s Twitter account also sent out — and then deleted — a photo of him seated behind a desk making calls to senators whose states were hardest hit. An aide said Pence was uncomfortable with the tweet because he preferred the focus to be on first responders and heroic Texans, not himself. In Texas on Thursday, Pence — a loyal-almost-to-the-point-of-obsequious soldier — was careful to repeatedly invoke Trump, including during a news conference at the end of his visit. He made clear he was simply bringing tidings of support and gratitude from the president. Arriving in Rockport, Tex., Pence told the gathered crowd he had called Trump from Air Force Two. “Just tell them we love Texas,” Pence said Trump told him to convey. At that, a woman in the crowd returned attention back to where Pence is most comfortable — away from himself and squarely on his boss: “We love Trump!” she cried. The majority of U.S. citizens do not trust President Donald Trump to make wise decisions about nuclear weapons, according to the latest poll by a leading research center. The Pew Research Center released Tuesday the results of a nationwide survey of people’s views toward Trump’s conduct and handling of his role as president, finding that 58 percent of respondents “don’t like” the way the Republican leader has carried himself in office. The same percentage lack confidence in his ability to wield the world’s second largest nuclear weapons arsenal, especially as Trump garners controversy over his responses to nuclear-armed North Korea’s continued defiance of U.S. attempts to disarm the reclusive, Communist state. 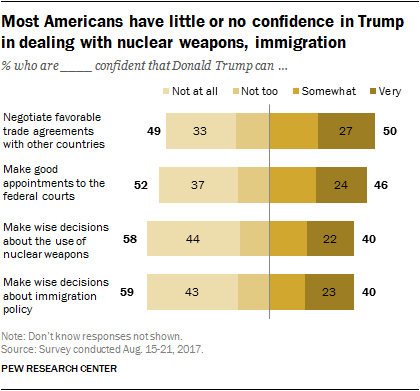 “Majorities say they are not too confident or not at all confident in him on each of these issues (58 percent on nuclear weapons, 59 percent on immigration), including more than four-in-10 who say they are not at all confident in him on these issues,” a report accompanying the survey results read. After initially boosting U.S. military presence to pressure North Korean leader Kim Jong Un in April, Trump has adopted an increasingly hardline stance against the ninth nuclear weapons power. Evading Trump’s red line on a sixth North Korean nuclear weapons test, Kim instead opted to test his country’s first intercontinental ballistic missile (ICBM) in July, and a second one later that month. Arguably even more significant than another nuclear test, the successful ICBM launch put the U.S. within range of North Korea for the first time ever. In response, Trump threatened “fire and fury” against North Korea and has made deeply disputed claims about the U.S. military’s capabilities. He said he had improved the country’s nuclear arsenal since taking office in January and later that U.S. missiles were “locked and loaded” in preparation to attack North Korea. Earlier this month, nuclear experts shared pictures of themselves chugging wine in concern over the president’s heated words and the consequences they might have. Trump has previously called for an increase in nuclear arms, reversing a decades-long trend of reducing weapons of mass destruction among the world’s leading powers. Faith in Trump’s ability to handle decisions in regard to nuclear weapons was divided by ideology. Some 77 percent of Republicans expressed trust in the president, compared to only 11 percent of Democrats. Republicans were less confident in Trump’s nuclear weapons policy than they were in his ability to negotiate favorable trade agreements with other countries (86 percent), make good appointments to the federal courts (83 percent) and make wise decisions about immigration policy (80 percent). Trump’s willingness to flex his nuclear muscles and recent testing of the B61-12 high-precision nuclear bombs have also got the world’s foremost nuclear weapons power concerned. Russia’s Ministry of Foreign Affairs said the U.S.’s latest, most accurate nuclear bombs could make Trump more likely to use them. “The advantage of the new modification of the B61-12, according to U.S. military experts themselves lies in the fact that it will be, as they put it, ‘more ethical’ and ‘more usable,’” Mikhail Ulyanov, the head of the Russian Foreign Ministry’s Nonproliferation and Weapons Control Department, told the state-run Tass Russian News Agency. Last week, Reuters revealed the existence of a confidential U.N. report claiming that two North Korean shipments bound for the government agency in charge of Syria’s chemical weapons were intercepted in the past six months. Put in its proper context, the news of the shipments, both of which violated existing international sanctions, is further evidence of North Korea’s nefarious role in spreading weapons of mass destruction and missile technology to other rogue regimes across the globe. The U.N. report highlights the extent to which North Korea has been a principal strategic partner to Iran and Syria for decades. Understood correctly, it should have major implications not only for how the U.S. handles the saber-rattling regime of Kim Jong-un but for how the Trump administration chooses to approach Iran today. Pulling a single thread reveals the tangled web of relations between Pyongyang, Tehran, and Damascus. Take, for instance, the 2007 Israeli raid that destroyed Syria’s covert nuclear reactor. North Korean scientists provided the technology and material for that reactor, which, according to former CIA director Michael Hayden, was “an exact copy” of a North Korean reactor. “The Koreans were the only ones to build these reactors since they purloined the designs from the British in the 1960s,” Hayden recalled. Ten North Koreans who “had been helping with the construction” of the Syrian reactor were killed in the Israeli strike, according to media reports at the time. In 1991, then-Syrian president Hafez al-Assad made a military-acquisition alliance with North Korea, which allowed him to purchase missiles from the North, and gave him access to the expertise needed to produce more-advanced weapons domestically. North Korea also helped the Syrian Scientific Studies and Research Center construct a missile complex in Aleppo used for fitting chemical weapons on Scud missiles in the early 1990s. A quarter century later, it turns out the two recently intercepted North Korean shipments were headed for the same Syrian agency. The timing is suspect as well. The U.N. report specifically addressed shipments intercepted in the last six months. The Assad regime only retook Aleppo from the rebels in December 2016. It doesn’t take an expert, then, to guess at the likely contents of the shipments. In the wake of the 9/11 terrorist attacks, the two states signed a “scientific cooperation” agreement. The year was 2002 — the same year that the existence of Iran’s own plutonium reactor in Arak was publically exposed. Tehran appeared to understand the benefits of redundancy; it was an insurance policy if something should befall its own burgeoning nuclear program. That helps to explain why Iran financed the North Korean nuclear venture in Syria to the tune of $1 billion. It was only then, in 2002, that the construction of Assad’s al-Kibar plutonium reactor began in earnest. Although Israel destroyed the site five years later, denying Iran the dividends from their investment, they were impressed by the cooperative agreement reached between the Kim and Assad regimes in 2002. The result was a duplicated and expanded science-and-technology deal inked between Iran and North Korea a decade later. Of course, the bilateral collaboration between Pyongyang and Tehran predates that 2012 agreement. For example, WikiLeaks exposed a February 2010 diplomatic cable from confirming Iran’s purchase of 19 advanced ballistic missiles from North Korea — missiles that put Western European capitals within Tehran’s reach. The watershed year between the two states came in 2012, as President Obama was concluding his disastrous nuclear deal with Tehran. Just as Iran’s Shahab-2 missile is modeled on North Korea’s Hwasoong-6, Iran’s Shahab-3 missile also matches North Korea’s Nodong. That shouldn’t be too surprising, considering that Iranian scientists and military officers frequently attend North Korean test launches of long-range ballistic missiles and have maintained a presence at North Korean nuclear-test sites for at least the last decade. It’s only natural that such curiosity would run both ways, too: From the 1990s onward, dozens of North Korean scientists and technicians are also known to have worked inside Iran. The watershed year between the two states came in 2012, as President Obama was concluding his disastrous nuclear deal with Tehran. According to detailed analysis published in February by Israel’s BESA Center, since reaching their cooperation agreement, North Korea and Iran have been working on “miniaturizing a nuclear implosion device in order to fit its dimensions and weight to the specifications of the Shahab-3 re-entry vehicle.” The authors of that analysis went on to conclude that, “the nuclear and ballistic interfaces between the two countries” are “long-lasting, unique, and intriguing,” and that North Korea is ready and able to clandestinely assist Iran in circumventing the nuclear deal, while Iran is likely helping North Korea upgrade its own strategic capacities. It should set off alarm bells that North Korea and Iran have been working together to overcome some of the remaining challenges that prevent Pyongyang from targeting the U.S. homeland with nuclear warheads — namely, the warhead-miniaturization process and the perfection of its long-range ballistic missiles. But it should set off sirens that some of that work has been carried out at Parchin, the Iranian facility that Tehran insists is a military site and keeps off limits to international inspections. Parchin should be familiar. When Obama administration officials were cooking up their nuclear deal with Iran, they repeatedly promised that critically important “anytime, anywhere” inspections would have to be part of the agreement. What happened instead was that they folded like a tablecloth, as they did on every declared red-line issue crucial to verifying Iran’s past nuclear-related military activity. In 2015, Iran’s Supreme Leader Ayatollah Khamenei personally and repeatedly rejected any access to what he called military sites, including Parchin. So Team Obama came up with a secret side agreement with the International Atomic Energy Agency (IAEA), which would allow Iran to inspect its own site and provide its own soil samples. Anyone could have guessed what would happen next. In 2015, Iran’s Supreme Leader Ayatollah Khamenei personally and repeatedly rejected any access to what he called military sites, including Parchin. “Despite years of Iran sanitizing the site and the Iranians taking their own environmental samples, the IAEA nonetheless detected the presence of anthropogenically-processed (‘man-made’) particles of natural uranium,” reads a new report released by the Institute for Science and International Security. After years of Iranian denials and attempts to block access to the site, it turns out “substantial evidence exists that Iran conducted secret nuclear weapons development activities at Parchin,” including “the presence of uranium particles” and “a variety of other evidence of work related to nuclear weapons,” the report claims. It goes on to note the many suspicious site alterations that Iran made after the IAEA requested access in 2012 — which, again, is when Iran and North Korea signed their science-and-technology cooperation agreement. It is also worth mentioning that in November 2012, the IAEA reported that Iran completed the installation of some 2,800 centrifuges at its Fordow uranium-enrichment facility, which was built and buried deep inside a mountain near the city of Qom. That report also noted that Iran installed more centrifuges at its fortified, underground fuel-enrichment plant in Natanz. Both facilities were producing uranium enriched up to 20 percent — a level useful only in the production of nuclear weapons. Add it all up, and it becomes clear that because of Mr. Obama’s nuclear deal, the U.S. and the IAEA don’t know the scope of Iran’s past nuclear activities at precisely the moment when that knowledge is critical. The same lack of access afforded by the deal also prevents the U.S. from grasping the range of North Korea’s nuclear efforts, specifically experiments relevant to the detonation of a warhead that took place at Parchin. And the kicker is that a growing chorus of analysts today is calling for the Trump administration to negotiate a similar agreement with Kim Jong-un. Let that sink in for a moment. Fifteen years ago, many scratched their heads at President George W. Bush’s inclusion of North Korea alongside Iraq and Iran in what he described as “an axis of evil.” Few recall that North Korea was actually the first of the three countries he listed in his 2002 State of the Union address, followed by Iran. It’s quite clear now that the third state on that list should have been Syria rather than Iraq. After all, according to Hayden, by 2001 the CIA was gathering “scattered, unverified and ambiguous information” regarding nuclear ties between Syria and North Korea. Even if the literal picture presented by Israel didn’t become clear until a few years later, by 2002 the two had signed their scientific-cooperation agreement and Iran’s plutonium reactor had become public. The writing was on the wall. The recent sanctions-busting North Korean shipments to Iran highlight how dangerous it is to seal a structurally defective nuclear deal with a rogue state while leaving other distressing aspects of that state’s behavior untouched. They should make it abundantly clear that we must seriously address this blooming axis of proliferation, because any bilateral agreement with one of its members can be easily undone by another.